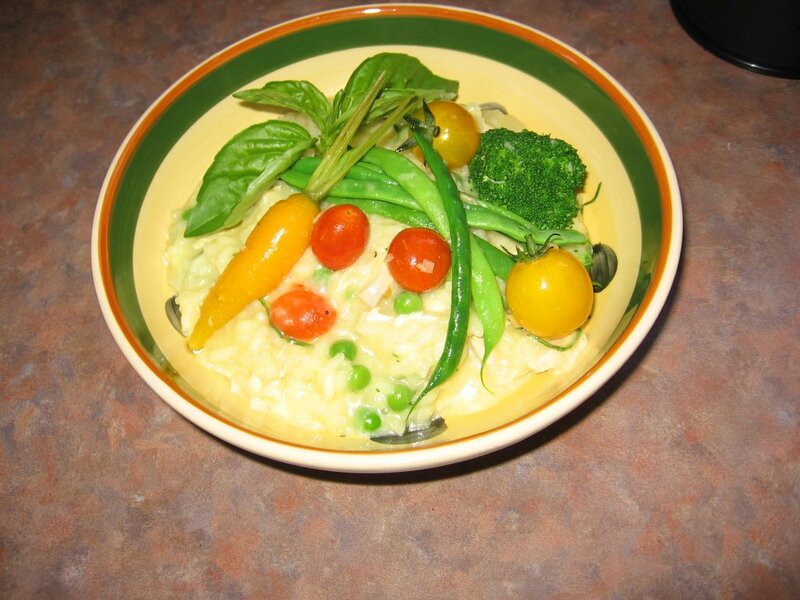 Risotto is a staple in this house. Now that good risotto rice is much easier to find and very affordable, we enjoy it often whether it is full of seasonal vegetables, chunks of seafood or just a simple Milanese. Tonight’s version was with basil, roasted chicken and fresh veg from my garden. Anyone can make a great risotto with the help of a good pot, good rice, good stock and good cheese! 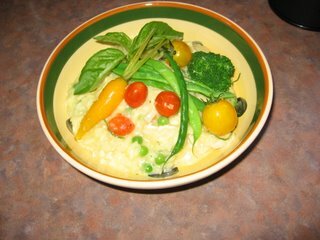 I never make the same risotto twice as I am always making variations with what I have on hand. If you don’t have a basic recipe, let me know, I’ll post one.Oh, and for the record, no risotto in Noah's diaper. He hates it. Something about the creamy texture but then those darn al dente rice kernels that you have to chew. It’s apple season!! The markets are laden with baskets of them and they are crisp, cheap and sweet. 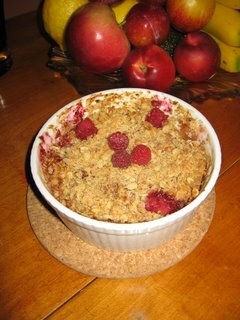 If you are wondering what to throw together for that potluck you have coming up or your mother-in-law’s weekly Sunday lunch, make a crumble. Do it. Everyone has their own recipe and version of what a crisp should taste like. Most of them are so full of sugar, you can’t taste the fruit. I made this one with honey, raspberries and wheat germ for something a little different and healthier. Here’s a recipe from Jamie Oliver that as little out of the ordinary, but delightful nevertheless. Put the fruit into the bowl with the balsamic vinegar, basil, and 2 tablespoons of sugar. Add a little more sugar if your blackberries are a bit sour. Mix and put aside to marinate. Using your fingers, rub together the flour, butter, and the rest of the sugar. I prefer to do this by hand as I like to end up with a nice rustic-looking crumble with some bits bigger than others. Put the fruit into an ovenproof serving dish or into individual dishes. Sprinkle the crumble mix over the fruit, making sure to pile more into the middle of the dish. Bake it in the oven for about 30 minutes, or until the middle of the crumble is evenly golden. Basil in a crumble?? This is freaking me out. However, I do love a good risotto... well, and a good crumble. I just dump, sprinkle and toss and can't seem to adhere to a recipe though (especially if said recipe consists of basil and fruit). 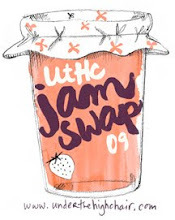 Rock on, Aimee - loving the blog! I just missed the apples! Ah! They are my favorite food! Cortlands are my absolute favorite and I've only ever had them out east and I've only lived out east a few years. I'm so sad. These foods are making me flipping crazy. I have to visit a different blog for a while. 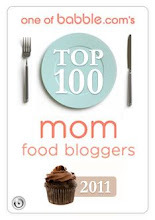 I have to start looking at your blog only when I am exceedingly full, that or invent a tele-porter thing to beam some of these dishes into my home and then into my belly!